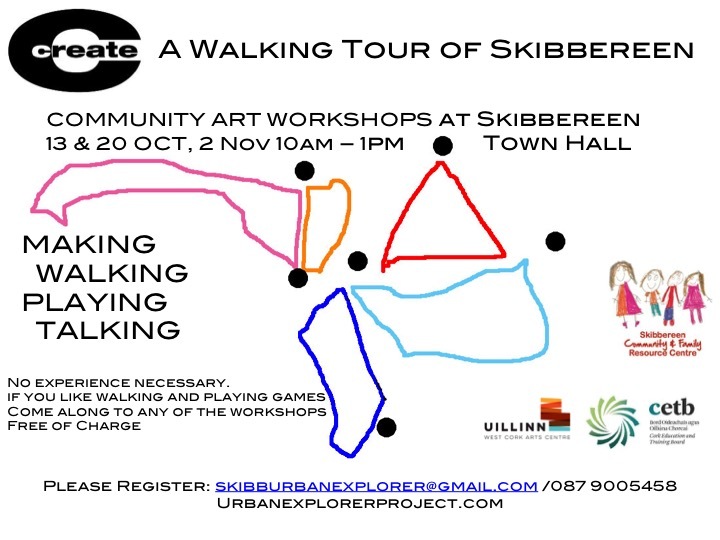 This Autumn why not consider participating in workshops to develop Walking Tours of Skibbereen. What would your walking tour look like? Whether you know Skibbereen as a native or not, there is always a different way of seeing what is around you. Each workshop is stand-alone and you are welcome to attend any or all of them. The first three are from 10am-1pm on 13th and 20th October and 2nd November at Skibbereen Town Hall. More dates will be announced later. Workshops are FREE of charge, thanks to the support of partner institutions. If you can walk and talk these workshops will be right up your alley. Together we will plan themed routes based on the interests and creativity of participants. In addition we will think about different ways we can conduct ourselves and be conducted in walking. Please wear comfortable shoes and be prepared to walk for approx 60-90 minutes, bear in mind that parts of Skibbereen can be quite hilly. If there is sufficient interest I am happy to put on a workshop specifically for people who have difficulty in walking or who may use wheelchairs/rollators (so please let me know). Prior registration essential. U-18s must be accompanied by parent or guardian. This project is supported by Uillinn West Cork Arts Centre, Cork Education & Training Board, Skibbereen Community & Family Resource Centre, Create the National Agency for the Development of Collaborative Arts and Cork County Council.